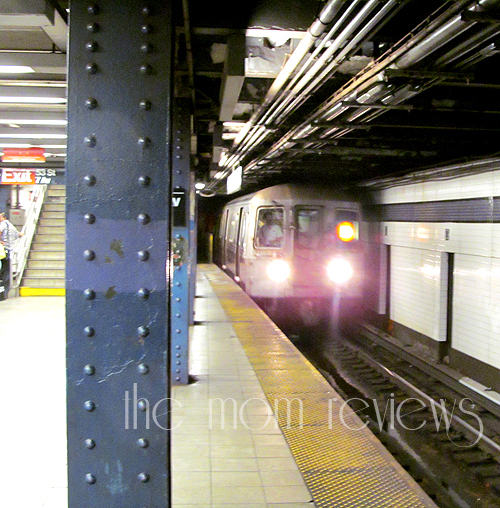 Musings of The Mom Jen: The New York Subway System? We Totally Rocked It! Home > The New York Subway System? We Totally Rocked It! The New York Subway System? We Totally Rocked It! Okay minus one trip from JFK airport to the hotel, we did ride in a towncar. BUT, after that we exclusively rode the New York Subway system or walked. Hubby and DQ were with me, they were my confidence. Had I traveled alone to the Big Apple, I may have hailed a taxi to get places and probably would have paid a ridiculous amount of money to go 3 blocks. Not one single taxi ride the whole time. The Subway is ridiculously inexpensive and amazingly efficient. Sure on a 90 degree day in the summer it literally feels like you are walking into the depths of hell down two or 3 levels underground. Sure it smells like pee, vomit, and other bodily fluids down there. Sure you feel like you could be mugged at any minute. Sure when you take it back to the airport with all your luggage you feel like you will fall down the stairs and die. Sure falling into the tracks and getting plowed by the train goes through your mind. Sure you hold your breath when your husband says, "we're under a river right now!" BUT, did I mention cheap. And efficient. 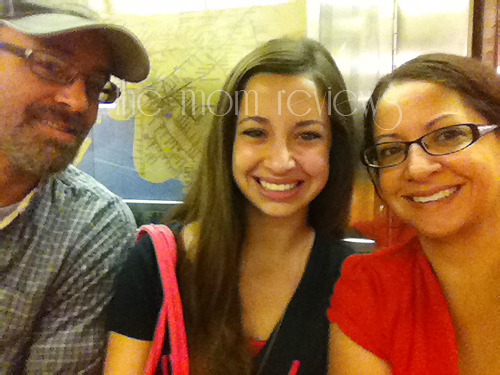 We rode to Yankee Stadium on the Subway. Hubby and DQ took it to the Brooklyn Bridge just before they walked across it. They even TRANSFERRED from one line to another. Pros I tell ya, we're pros. Plus there's A/C in there. Maps to help you find your way. Even the cleaner and newer trains talk to you so you know where to get off. We didn't drive or ride in a car for almost 5 full days. That's big for these Californians! Now I feel all fancy when I tell people, "oh sure, the E train takes you all the way to blabbity blah" and "if you transfer from the S to the R you'll be smack dab in hoobity hoo." How do you get to JFK? Well you take the E to the Jamaica AirTrain goobledy goo. There is that feeling of victory in conquering a foreign travel system, isn't there? That's how Kat and I felt when we managed the Seoul, Korea subway system. Ok, girl! Have you been doing something to lose weight? You look so skinny in that pic at the subway where you can see most of your body! Or at least skinnier than other pics of you that I remember seeing on here before. You go girl!! ha ha. I rode it in November and maybe got lost 1 time with my parents. i am IMpressed! living here in nc is not as rural in most places as people think, but in most parts u only call a cab if u are out drinking and ofcourse we have no subways. i would never do the subway thing in NY alone but prob. would,like you, with friends or family. there is strength in numbers! You go girl! One experience was enough for me LOL! I have never done this and I'm pretty sure people could tell I didn't know what I was doing! way to go!! i've never taken a subway and yes i'd also be apprehensive but with my family/friends i think i'd make it ok! Ive been to New York but didnt ride the subway,you are very brave! I've never used the New York Subway before,but I used the Washington D. C. Subway!It was a couple years ago,but I thought it was pretty neat and e3asy to get around on ! My son loves, loves, loves trains. We have ridden the trains here in Philadelphia, but he would LOVE to ride the subway in NYC! I am a person who loves taking pictures of everything, always do and these pictures of the subway I would! Way to go - you're a pro! I have never been to New York and would be scared to death to ride the subway. My daughter went there and rode the subway and said it wasn't bad at all. My fears are all of the above you mentioned. Who knows maybe some day if I visit New York I WILL ride the subway. I have never been ti New York and I am not sure I could make it through the subway system unless I had someone else there with me. I would get lost somewhere. You rock. I can never understand the subway and I always end up getting lost. Even though I always go with a buddy. haha, made me laugh...all those smells, etc but we do like inexpensive. You're too funny! The first time I was on a NYC subway I was definitely scared and did not know what I was doing or if I would ever get to where I wanted to go. But after a few times I feel more confident although I would not want to go on the subway every day. I had a lot of people helping me with directions though.